We got back to Freiburg by ICE (InterCity Express, the German superexpress train) that we had transferred to from an ordinary train at Offenburg. We didn't need to make haste, but the French Rail person decided so without asking us. Anyway, it was all right because we reached our hotel. When I entered our room, I found 41 Euro in the envelope on the bed on which only my name was written. As soon as I saw it, I understood it was from Steiert, but there was no apology. I didn't miss the 41 Euro. Would one who misses 41 Euro come to Germany from Japan? I really wanted to be apologized to for the sudden cancellation. I think that the firm that never apologizes for its own fault shouldn't be trusted. What would they do in a case of a more serious accident? We went out for dinner and headed for the Old City in accordance with my rule that you should have domestic or local dishes when you are out for a trip. We took seats in a restaurant near the Cathedral and ordered two kinds of domestic dishes like the pictures. They were so delicious and went with Badisch wines. I shared the dishes with my daughter. 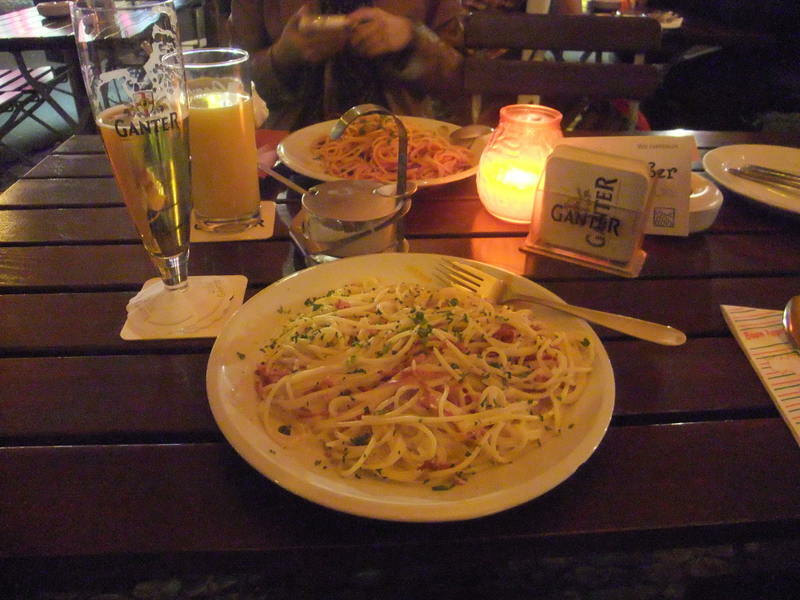 This was the last dinner in Freiburg. The last picture shows the sign saying the present condition of the air. It looked like we were in a clean environment. We got back to Germany by a bus and this was the last time passing over the border for this trip. I was expecting to be checked at the immigration control at every border and the number of stamps on my passport would rise, but there was no check at the borders. The pictures were taken on the bridge over the river Rhine, the border between France and Germany. 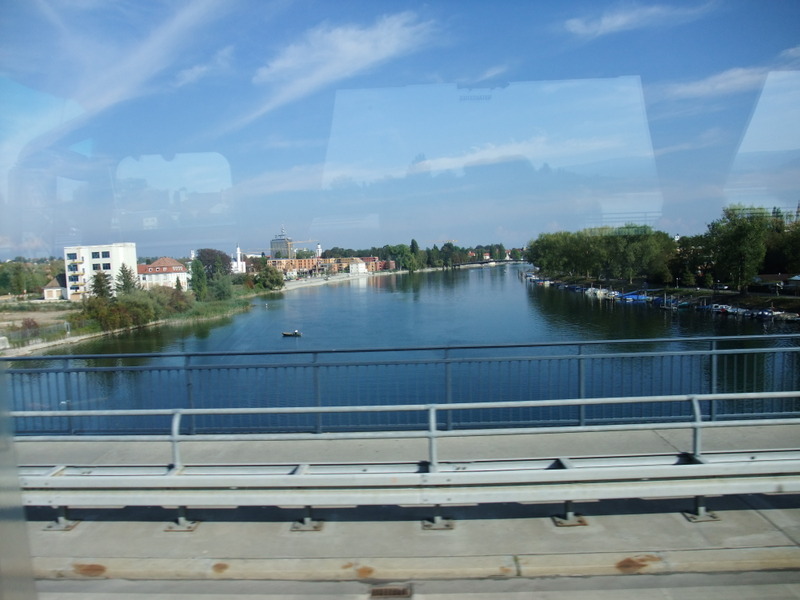 The fourth picture was shot when we just passed through the bridge and we were in Germany. We got relieved and relaxed to be back in Germany though we aren't German. I can understand German a little, but it wouldn't be the reason why we felt happy here. I think that my relief would imply that I really came to hate France this day. By the way, I recalled a tiny bridge that had been the most miserable and ridiculous bridge in the world. I visited there with my eldest daughter early spring and wrote the trip notes in this blog. If you are interested in the bridge, please look here. Will the day come when some day people could freely walk on the bridge? 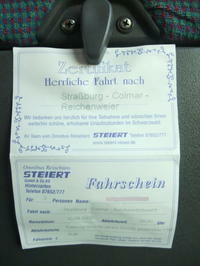 The last picture shows the ticket from Strasbourg to Freiburg. I noticed the schema of a block calendar and a clock on the face. It might have been for people who didn't know French, but I thought that "DATE" or "TIME" should be all right. I wondered how high the literacy rate is in France. The picture is of the Cathedrale Notre-Dame, which was the main tourists' attraction of the Old City. I lost my words to see it. It was so monolithic and magnificent. We could go up to the top of the tower, but we were sick and tired of staying in this city and only took some pictures here. Originally, I was intersted in the history and I had a little knowledge about the history of this area, Alsace, but I got to become indifferent to them. I didn't know why? When Matsuyama castle in my hometown was under renovation for two years a few years ago, two pictures were found on the ceiling. They must have been drawn by a renovation worker 200 years ago. When I saw them, I felt as if I were chatting with him. Likewise I really wanted to see only a stroke of the sculptor in the Cathedral, but such a desire seemed to disappear. Maybe it was due to the unkindness of the French people. At any rate, we headed for the station. At the station we were at a loss how to get the ticket to Freiburg. There was no ticket-vending machine which we were familiar with in Germany. I asked three staff members of the French Rail Company. Their attitude was utterly impolite and rude. We were strangers in Strasbourg and it was natural that we didn't know the French way. I thought all three could understand me, though I asked in English. My daughter also did in German. I didn't think that these three staff members were the representatives of all French people, but I would never visit France again. All of my family members love skiing. The transborder ski tour from Chamonix in France to Italy could be the best memory of my family before one of my daughters would have gone with her partner. However, this plan has disappeared completely. After coming back to Japan, I told this to my wife, who had visited France four times on her business trips. She told me, "At first, you should say 'bonjour' and their attitude would be changed." Really? but I've had enough of France. We managed to get tickets for Freiburg and had some time to go and walked around the station. We happened to find a TGV (superexpress train in France) and took pictures. If we had had sufficient time, we could travel around Alsace province from Freiburg, via Kehl, Strasbourg, Colmar, (Riquewihr,) Mulhouse and Basel to Freiburg in a day. It would have been a great one-day trip, starting from Germany, via France and Switzerland, and returning to Germany. As I wrote in the previous entry "Fraud? ", I was really sorry not to be called from Steiert the previous night. It was about 1:00 p.m. when I looked at my watch after lunch. It was too late to visit Riquewihr and Colmar. I knew it was no use to regret what had happened, but I couldn't help thinking that if we could leave Freiburg earlier, we would be able to see the scenery of Alsace. Anyway, we decided to take the sightseeing boat, which cruised around the Old City of Strasbourg for 70 minutes. I'm showing pictures from the boat, which were blue-colored through the window of the boat. The scenery from on the water was not bad. There was guidance in Japanese, though the pronunciation was a little weird. Why didn't they ask a Japanese to record the notes. The boat went around the Old City and after that, it took us to the European Union Parliament and European Court of Human Rights. I realized that this city was the center of the EU. Additionally, come to think of "the center", Strasbourg means the city of the streets. It might have been the center of this area from long ago. After 70 minutes cruise, we went to the symbol of this city, Cathedrale Notre-Dame. We had visited several cities and watched a few cathedrals, but Cathedrale Notre-Dame was literally different from others. I'll write about it in the next entry. 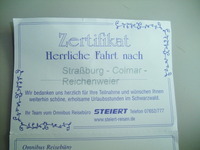 I read the part of Colmar and Riquewihr of the guidebook on the previous night but didn't about the part of Strasbourg. I'd just thumbed through it on the train and didn't have any plan and so, we decided to wander around the Old City, the main tourists' attraction. I'll show you some pictures and add short remarks. If you want to know where the pictures were taken, look at the route map linked from "Today's Route" above. We stepped into the Old City through the Pont Kuss (Kuss bridge). It was a German city rather than a French city. Lots of houses had the structure of wooden framework. The Old City is situated on the Ill river, a branch of the river Rhine. Several tour boats run on this small river in the corridors of water. As far as I noticed, there were two water level regulators. I don't know if this term is correct, but you can see the same system at canals. This building seemed to have been used as a jail. Now that you mention it, it had an atmosphere that was compatible with the jail. We went into the historic area that was called petite France, but the houses had apparently been influenced by the German culture. Don't you think so? I had written about the flowers at the windows of German houses in this blog and a Canadian who was living in Freiburg sent me an e-mail like below. For your information, some of the large flowerbeds on European homes are not just beautiful, but also functional. Depending on the flowers which are planted, some of them can keep mosquitoes or flies at bay. By placing these flowers around windows and doors, the house can be kept free of mosquitoes and sometimes flies as well. No matter how much the German people love flowers, I wondered why they decorated windows of their houses with flowers. I fully understand the reason, after hearing from him. The functional aspect of decoration was really acceptable. This picture was the Chinese restaurant where we dropped in and ate lunch. It looked bad, but the taste was not bad. After about one hour of walking, I thought that this city didn't look like a kind for tourists. There were really no signs for tourists that were written in English. We were often stranded. The menu of the restaurant we ate lunch at was written in French. They didn't speak English. They might be able to speak in English, but didn't. I don't agree with English monolingualism and I know and understand their historical background, but now, like it or not, English is the actual common language in the world. I couldn't agree with the stubbornness of French people. We crossed the river Rhine and entered France. I found the large blank space on the right side of the street at the end of the bridge. There's a big facility on the satellite image of the Google Map, so there must have been the immigration control up until very recently. Our bus stopped in front of the Strasbourg station after a fifteen minute ride. The first picture was taken there against the station. 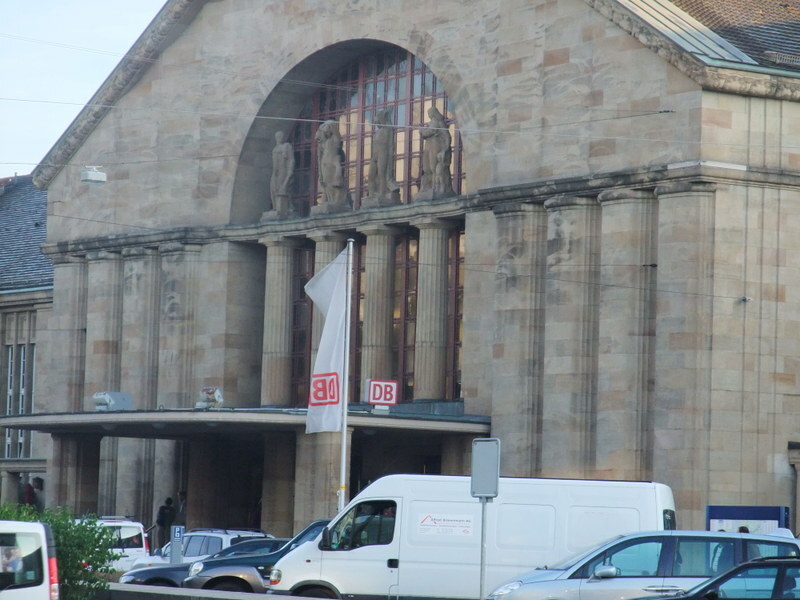 The next picture is the Strasbourg station though it looked like a ballpark or a museum. We walked on the street which was called "Rue du Maire Kuss" in the third picture. I found the McDonalds also here. I had been afraid on the bus that the weather would get worse, but it got better and it made us happy. We got to the place in the last picture about ten minutes later. The bridge behind Yuri is called Pont Kuss (Kuss bridge) in French. We stepped into the island-like old city. I'm going to show you some pictures in the next entry, and I felt the German culture here in France! I imagined that the last class by Alphonse Daudet (La Dernière Classe in French) might have been written here. By the way, there wasn't the ballpark-like Strasbourg station on the satellite image of Google Map. This station must have been built recently. We took seats on the right side. Shortly after the departure from Offenburg, I knew our train had turned a sharp left while I saw the railway track running straight from just beneath us. The train track was bifurcated several kilometers up north of Offenburg. I visualized the map of around here and knew that we were traveling to the west. About ten minutes later, the train reduced its speed abruptly and came to a standstill at the station that you can see in the first picture. A few dozen of teens and their teacher-like persons got onto the train here. I wondered from where they came. This station seemed to be just like the "Hikyo Eki" in Japan. It means the stations that are located in rarely-visited regions. The hundred stations are sanctioned as the "Hikyo Eki" and visiting these stations captures the hearts of many Japanese now. The stations, which you can't easily get to without trains and there are few houses around, are called "Hikyo Eki". Don't you think that this station was just in that category seeing the picture? After coming back to Japan, I checked the map and got the truth. A town was stretched out to the south from the station and it was the opposite side of our seats. It was not the "Hikyo Eki". While remembering the "Hikyo Eki", our train slipped into the Kehl station, which seemed to be deserted. I didn't notice at that time, but this station looks like used to be huge judging from the satellite images. From Frankfurt to Basel, there is no branch line to extend to the river Rhine but this one, so Kehl might have been the important junction where the cargo was landed and loaded into the freight car. 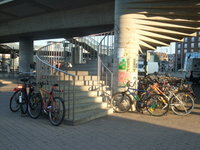 I took a picture of the entrance of the Kehl station. 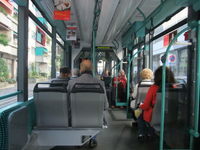 The last picture was of the bus that we got on from Kehl to Strasbourg. The spelling of Strasbourg was wrong. After we knew about the cancellation of our bus tour, we decided to go to Strasbourg ourselves by the train. We didn't have enough time and had to give up visiting Colmar and Reichenweier (Riquewihr), but we tried to see at least Strasbourg, the capital of Alsace province in France. We went back to the hotel to get the time schedule book of the trains and then headed for the station. The picture shows the ticket that we got then. 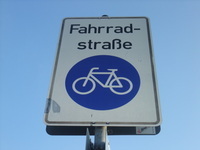 The abbreviation "von" is "from" likewise "nach" is "to", "ab" is "departure" and "an" means "arrival". This ticket is very understandable. We got on the IC (InterCity) and got off at Offenburg to change trains. 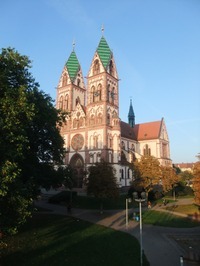 Another picture was taken in Offenburg at that time. Can you see the letters on the train? "ALSACE S'Elsass" cheered me up. We took this train to Kehl. During our stay in Germany, we were really happy campers all of the time except for one abominable thing. I'll mention it. We were waiting for the bus in front of the Novotel Hotel. We got to the designated point at 8:50 and our bus was to come at 9:00. However, the bus still hadn't shown up by 9:20. I called the bus company, Steiert, which we had used two days before, and the lady on the other end of the line just said, "It was canceled" in a businesslike manner. Just before starting our tour to Insel Mainau two days before, I was told that today's bus tour would be held, and I paid the tour fee at that time in Hinterzarten. Then, the tour had been canceled abruptly without any notice. Why didn't they call us? They knew our hotel and my cell phone number. I'm not sure but, it might be because most people who would have joined the tour canceled it. Anyway, the company could have called us the previous night so that we could figure out another sightseeing plan. Nevertheless they didn't. I thought that they should apologize to us at first, but they didn't. Their attitude was just a businesslike manner. I got pissed off about their attitude. If the lady on the opposite side of the phone had apologized sincerely, it would have been okay and I would have accepted her excuse. I couldn't forgive her and asked her about the 41 Euro that we had already paid though I didn't miss the 41 Euro. To my surprise, are you sitting down?, she told us to come to Hinterzarten to receive the money. Hinterzarten is a 50 minute train ride from Freiburg and two round tickets cost 20 Euro. We didn't want to waste two more hours and 20 Euro to get 41 Euro. I answered as my parting shot, "We have no time! If you are sincere, you can ask the hotel to repay us instead of you." I didn't miss the 41 Euro, but we missed three or four hours in Freiburg. What do you think about that situation if it were in Japan? The company would issue a kind of discount ticket so that we could join the bus tour again. They would manage to clean its tarnished image. Trust is the key in Japan. Or, is the above the German way? I was disappointed but I don't want to believe it. I would give the sage advice to the people who will visit Freiburg from Matsuyama city from now. What advice? Naturally, "Don't use Steiert!" I'd also like to add for the sake of the Steiert that dirty bills of 41 Euro were put on the bed when we came back, but there was no message for apologies. One more thing, when we were in front of the Novotel Hotel, I saw the mayor, Herr Dieter Salomon, entering the adjacent building, whom I had a short talk with in Matsuyama this spring, but he seemed to be busy and I didn't speak to him. We were going to visit Alsace in western France on this day. Alsace is well known as the province which had been involved in the wars between France and Germany, and had been part of Germany in a certain period of time. 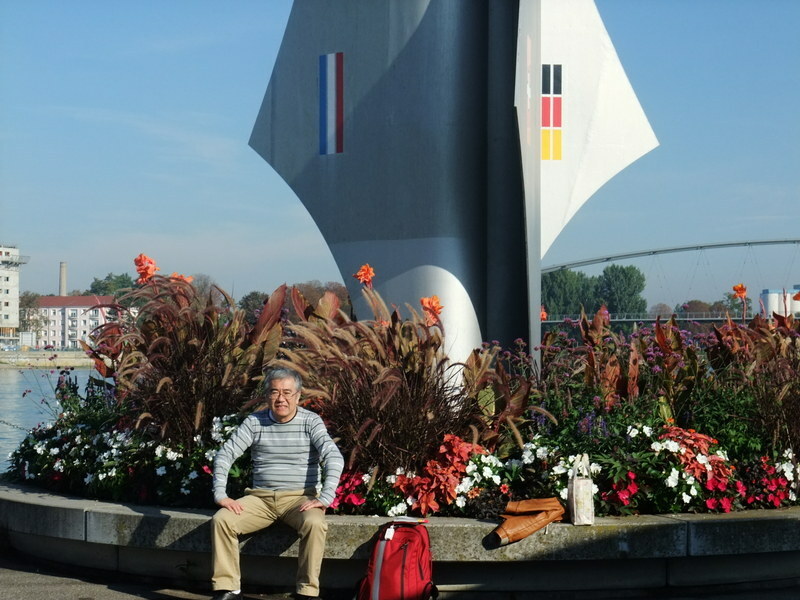 Alsace has such history and its culture had been under the influence of Germany. The capital is Strasbourg, and this city was one of our destinations. One more thing about Alsace; Alsace is also noted with its great wine, and the small wine-producing villages stir the imagination of Japanese. In the Japanese famous Hayao Miyazaki's directorial production of Howl's Moving Castle, a small city of Colmar in Alsace was the motif of the movie. We left our hotel at about 7:30, after the third time of having breakfast in this hotel. I like the western style breakfast as well as the Japanese one, but we had nearly the same breakfast every morning after we had arrived Freiburg. We were sick of it, but the price of breakfast was included in the accommodation fee and so we ate there. 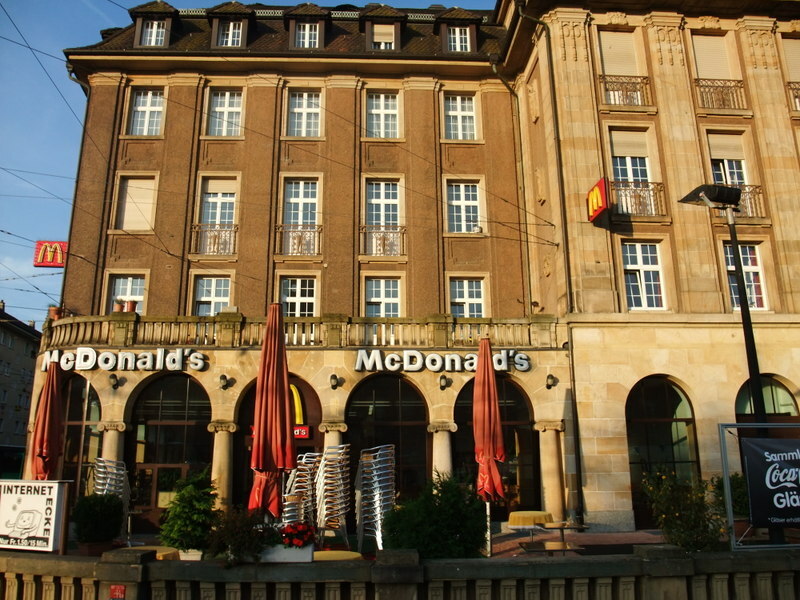 In general, it seemed that the accommodation fee of German hotels includes the breakfast. By the way, we would join the bus tour of Steiert, which we had used the day before yesterday to visit Insel Mainau. The bus was to arrive at Novotel Hotel just in front of our hotel at 9:00. We had about an hour to go and took a walk at the west side of the station. The day in Germany starts early in the morning. The first picture was after the morning rush hour. We could look down on a few offices of the adjacent building from our hotel, and several workers were already there by 8:00 in the morning. Was it like this across the country in Germany? Next, I took a picture of a magnificent building. Was it a church? I didn't know, but it was so beautiful in the morning sun. When I went down from the elevated bridge in front of the Novotel Hotel, I took a picture of the spiral stairs. I think that such places that were hidden from the people's eyes could be a gauge of the security of the neighborhood. I thought the security of the city wasn't bad after seeing some places during our stay in Freiburg. However, one thing had weighed on my mind. Freiburg was deluged with graffiti. They spoil the modesty and tradition of the city. The last three pictures were taken in front of the Novotel Hotel while we were waiting for our bus. We had dinner in our hotel. It was very good. 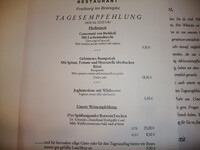 Naturally all the menus were written in German and the prices were in Euro. Every dish was new to us and we were lacking the sense of reality about prices. The dinner was delicious, but after thinking of the price in yen, I thought it should be so. 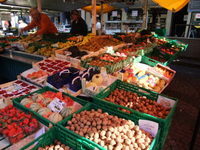 By the way, I didn't think vegetables were good in Germany, though I visited only Frankfurt and Freiburg. 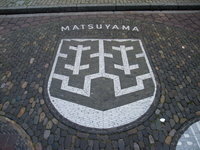 We heard of the emblem of Matsuyama City, which had been imprinted on the pavement in front of the City Hall and looked for it after we parted. The emblem was easily detected and we took pictures of it. 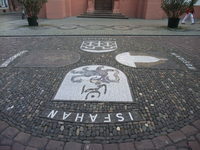 The emblems of Freiburg's sister cities seemed to be arranged there. The name of Matsuyama was known to the front staff of our hotel, but Ehime prefecture where Matsuyama is located was unknown. Next, we dropped in at the shop shown in the next picture. I tried to speak in German here, and said, "Ich komme aus Matsuyama." It meant that I came from Matsuyama. The lady at the shop replied promptly, "Oh, Ehime FC!!" This shop was the fanshop of Freiburger FC and this team has a friendship treaty with Ehime FC. It was the first time to hear "Ehime" in Germany. The last picture is inside of the City Hall. Is it a court? I'm not familiar with the structure of German buildings and I got restless due to the loneliness. We could use an ICE from Basel SBB to Freiburg, but didn't. We got on a local train there and changed trains at Basel Bad Bf. There were three kinds of national railways in the city and it was really confusing. 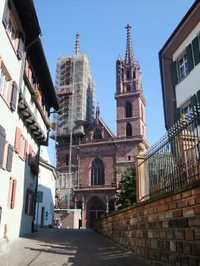 We asked people here and there, and managed to come back to Freiburg at about 15:00. 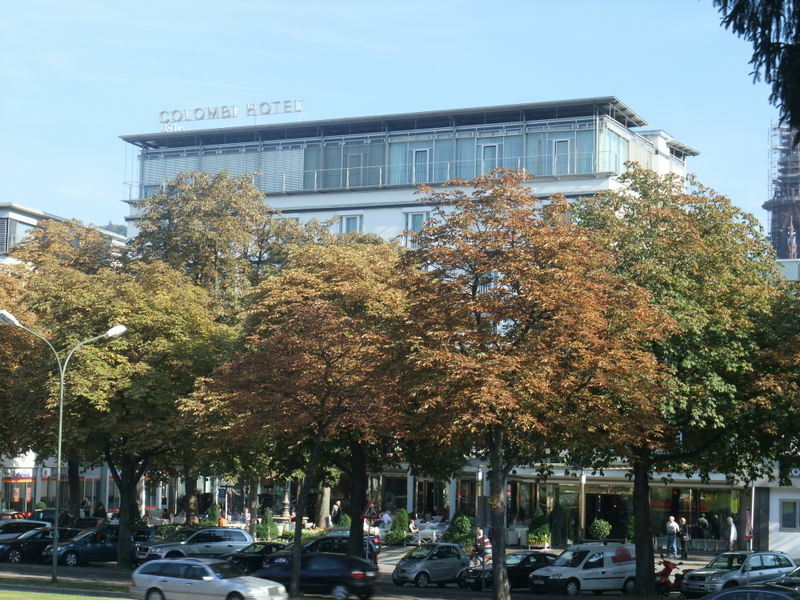 I would have liked to have stopped over at a small station on the way, but we had an appointment at 16:00 at Colombi Hotel in Freiburg, so we got back early. The scenery on the way was beautiful under the clear sky. His co-worker was able to speak English and Japanese along with German, and it was so useful for our communication. My acquaintance treated us to nice cakes, but I was sorry to forget to take pictures. I don't remember the exact name but, my cake was SchwarzwŹ«Łldertorte and Yuri's was Waldbeertorte. Both were typical cakes in Germany and delicious as we expected. Especially, Yuri told that she had never eaten such a delicious cake. 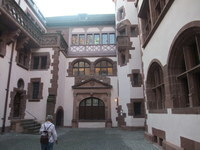 We chatted about Freiburg and around, and it was very useful for us. 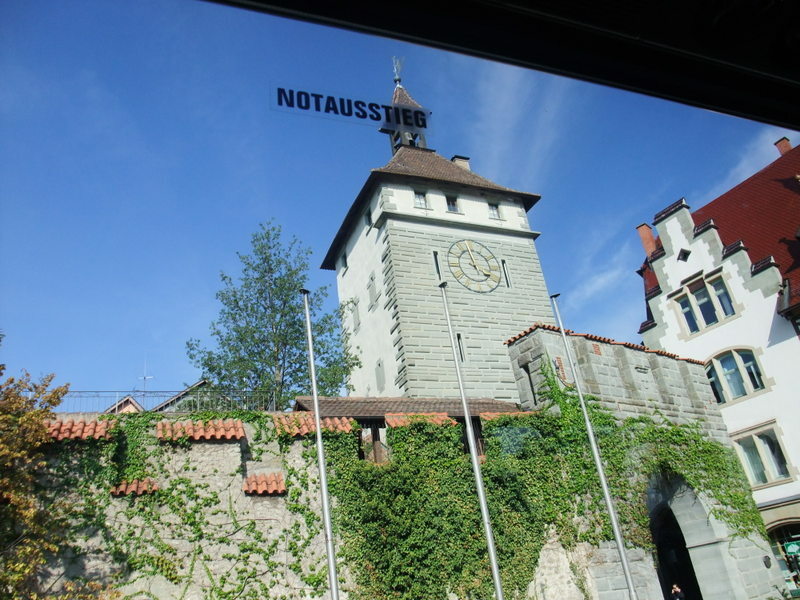 The price of commodity and average salary of workers in Switzerland, the population outflow to Switzerland, the terrain of Alsace, a dormant volcano,,,. I was particularly surprised to hear about the lack of medical doctors and care workers. They seemed to work in Switzerland to get more money, while living in Germany, where the tax was lower than in Switzerland. My skill as a general surgeon, majoring in the surgery of the stomach and colon, must be useful also in Freiburg, and I was interested in living in Freiburg, but the decrease of income wasn't acceptable. 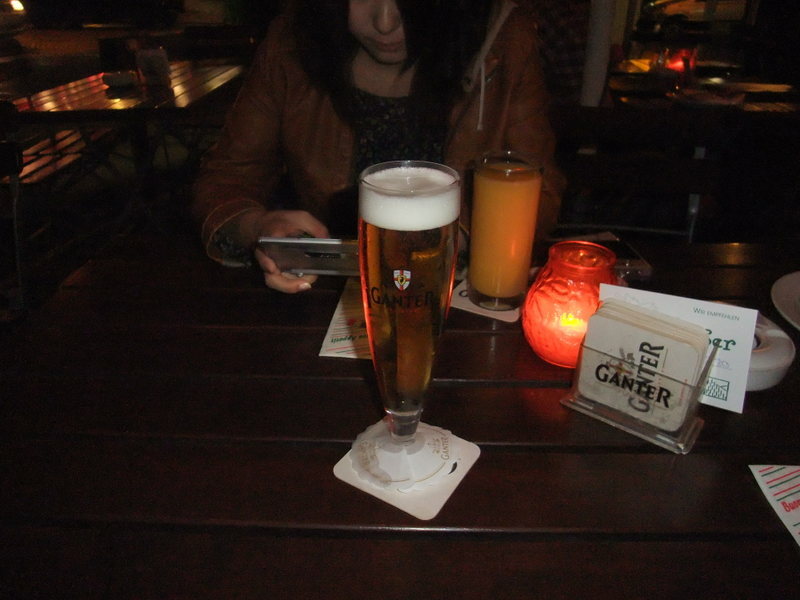 As for Yuri, she was mainly listening to our conversation, but she got to thinking about living and studying in Freiburg. 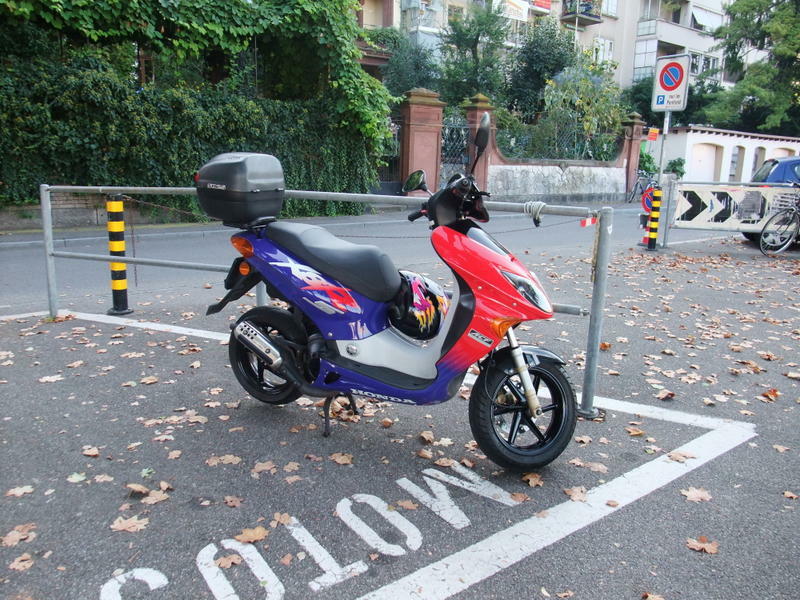 I knew that the security of Freiburg was as good as our hometown. I asked them how to apply for courses of the university. I could get valuable information from them. Yuri might be in Freiburg at this time next year. 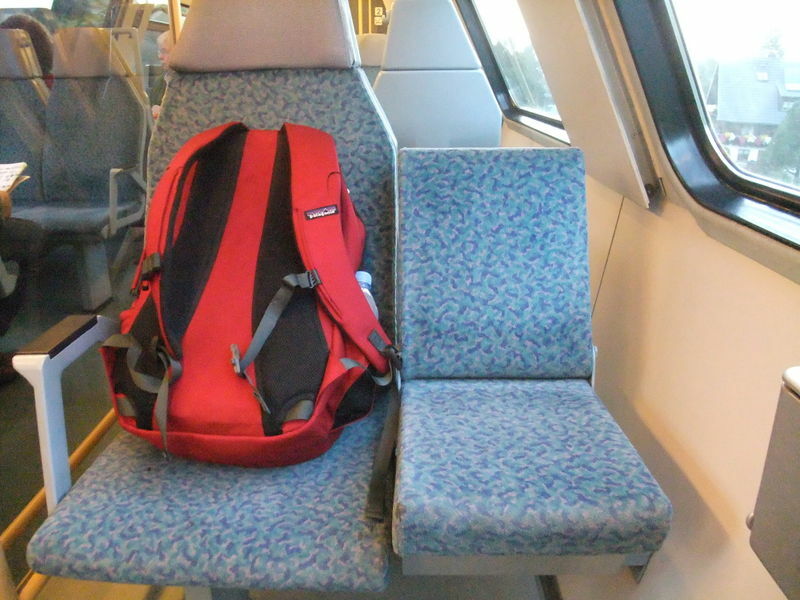 We got to the Basel SBB. I took the first picture at the entrance. It looked not so big, but when we went up to the second floor, we found so many tracks. By the way, the first thing that we wanted to do in this station was to go to the toilet. We couldn't find any in the street, so I got relieved to see the sign "WC" by the escalator in the picture. We hurried to the toilet and sadly found it a pay one. Men needed one franc and women two francs. I got disappointed to know that because I thought we didn't have any Swiss Franc. However, I had three francs in my pocket. Those coins were thrown into my pocket in an offhand manner at the market stall in the Markt-Platz. They were the change of our expensive lunch. I remembered the Giuliano Gemma starring movie, "Un dollaro bucato". If you know the plot of the movie, you could understand us in this situation. 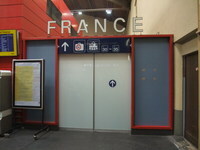 After that, we explored in the station and found the door on which "FRANCE" was written. There seemed to be Track 30-35 bound for France over the door. We were enticed to go through the door, but we didn't, because we would be at a loss if the door didn't open automatically from the opposite side. 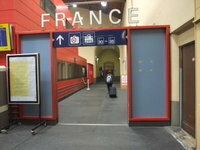 The opposite side of the door was the Basel SNCF, the station of French National Railways. 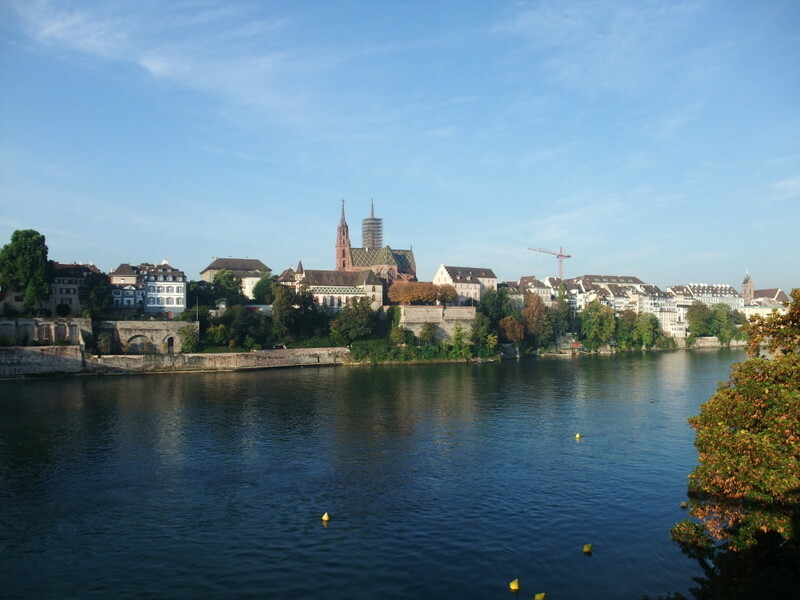 We headed for the Altstadt of Basel then. As we walked, we happened to come across a tram station and got on a tram that I thought, would go to the south. It was lucky that the tram took us to the center of the city. It was also fun to use a tram in the strange city. As we didn't have any special purpose in this city except visiting the three countries' corner, we could get off wherever we wanted and we were dropped off at the busiest street. 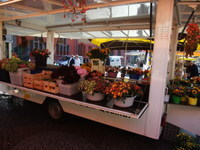 It was the Markt-Platz, which means market place. The Markt-Platz was not so wide, but attracted huge crowds. Various vegetables, flowers and foods were sold there. I don't usually buy vegetables in Japan and didn't know if the prices were reasonable or not. I found a group running on Segway. 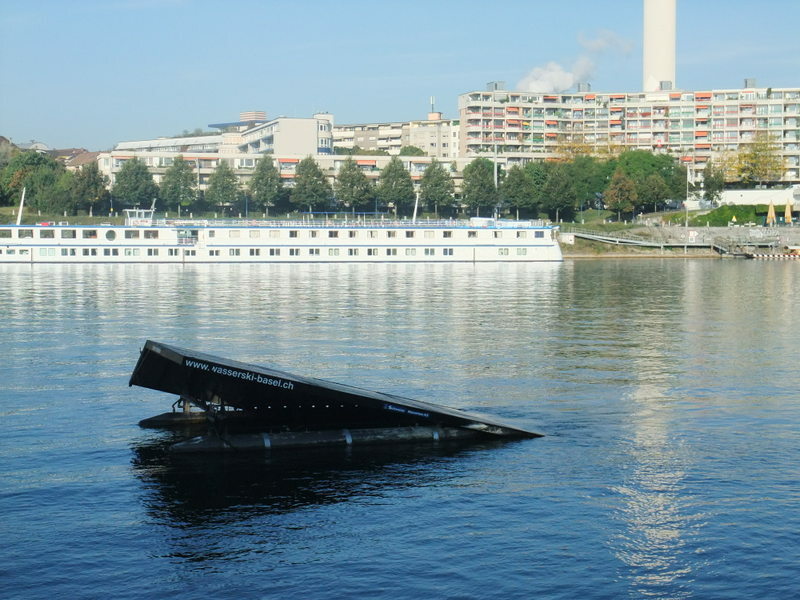 It said "Basel Tourismus" on it. They must have been tourists. I'd never get on a Segway. The next time I would try it. 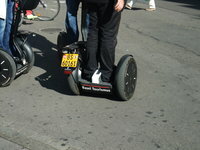 The Segways had their license number plates on it. That is to say, Segways are supposed to be allowed to run on the streets though it is not permitted in Japan. 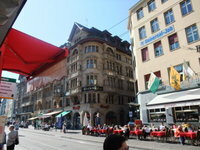 There were many tables around the Markt-Platz, but we tried to have lunch in a market stall. Two sausages, a bottle of mineral water and a non-alcohol beer cost twenty-some Euro. What? Though the woman at the stall didn't look bad, I thought she might be cheating us. The price was unbelievably high. The Swiss currency is Swiss Franc (CHF) and 1 CHF equals to 103 yen, while 1 Euro equals 133 yen. We didn't have CHF and had to pay with Euro. She asked twenty-some CHF and we paid twenty-some Euro. To tell the truth, I didn't know that Switzerland wasn't a member of EU until then. I received some coins from her and ate expensive sausages. (grin) After lunch, we took a walk around and took lots of pictures. The last picture except two was of a sightseeing boat. The boat was going upstream. The next picture was of the Cathedral which was under repair. We could go up the tower, but didn't. I'm afraid of heights. We got on a tram again at the station in ! 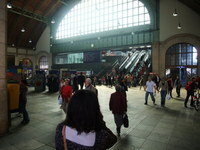 the last picture and moved to the Basel SBB, the Basel station of Swiss National Railways. There wasn't any special reason why I visited the three countries' corner and I just wanted to see the place where the three borders crossed. The first picture shows the way to the point. 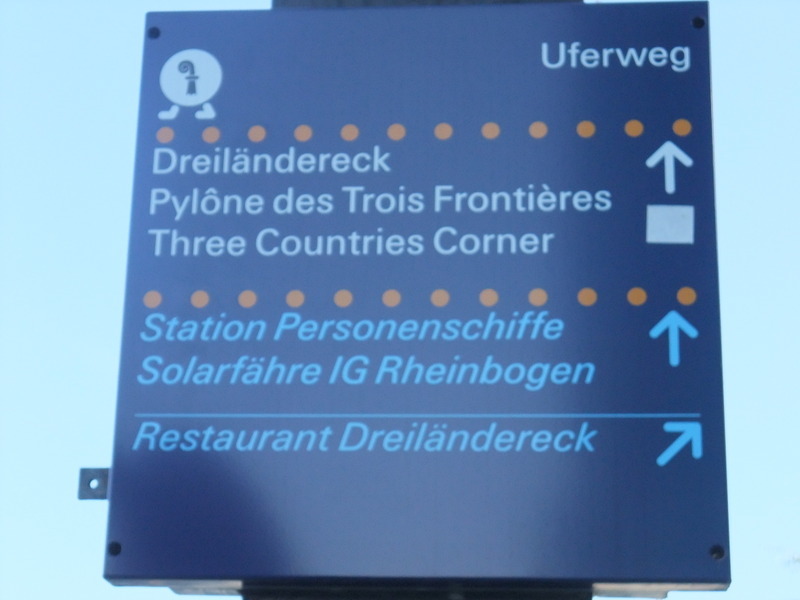 "Drei" means "three", "länder" means "countries" and "eck" means "corner". The city, Basel has three nationalities and isn't this so rare? What is the daily life of people like? Are the consumption taxes of these three countries the same? Are there three kinds of polices? If a man who lives in a German area was transferred to an emergency hospital which was located in the French area, does his insurance work in France? Mysterious but simple questions came up to me. Walking downstream along the river Rhine, we got to the point. I'll show you some pictures which were taken there. 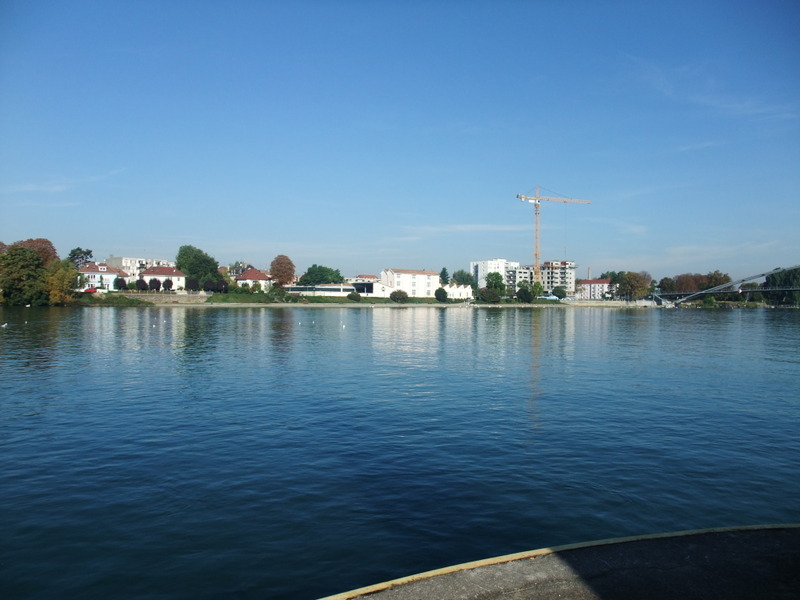 The second picture is the French area and the third is the German area, where you can see a few sightseeing boats. The three countries corner is located just in the center of the fourth picture. In this picture you can also see a cargo ship. The height of the ship is short and I suppose it's because of many bridges over the river Rhine. 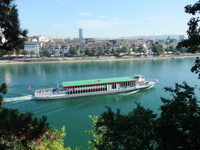 The river Rhine must be the big artery of transport at present too. In the fifth picture two boats are shown and there was a nice restaurant in the boats. We met two aged couples and asked one of them to take our picture. 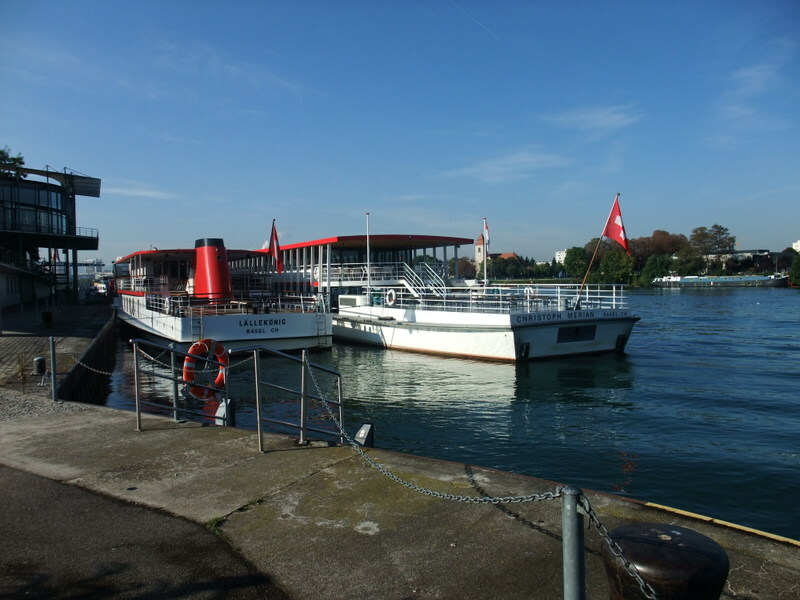 They came from near Konstanz and would go back by this boat. The river trip would be fun. You can see these boats on the Google Earth, also. The last two pictures were of the monument of the three countries' corner. 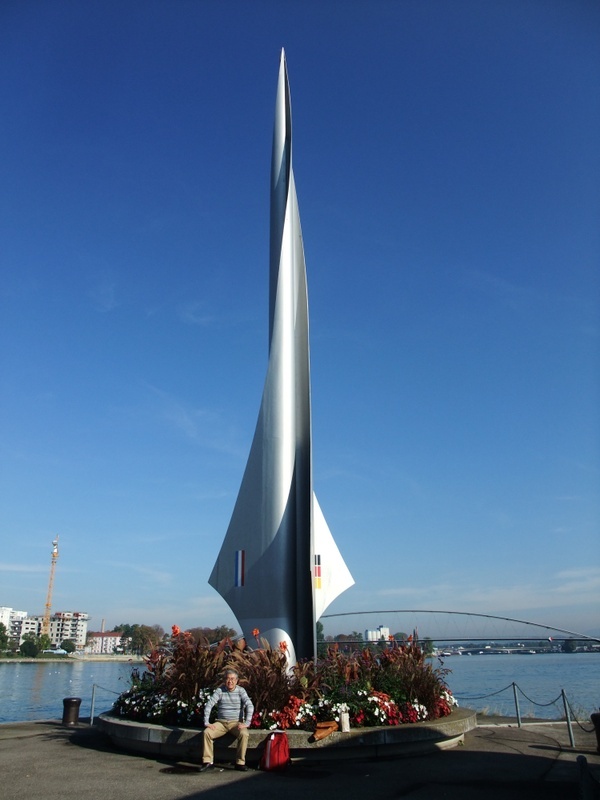 If you look at the last picture mindfully, you would notice the national flags of three countries on the monument though the Swiss flag is so small. I advise you to enjoy seeing the borders on the map linked from "Today's Route" above. 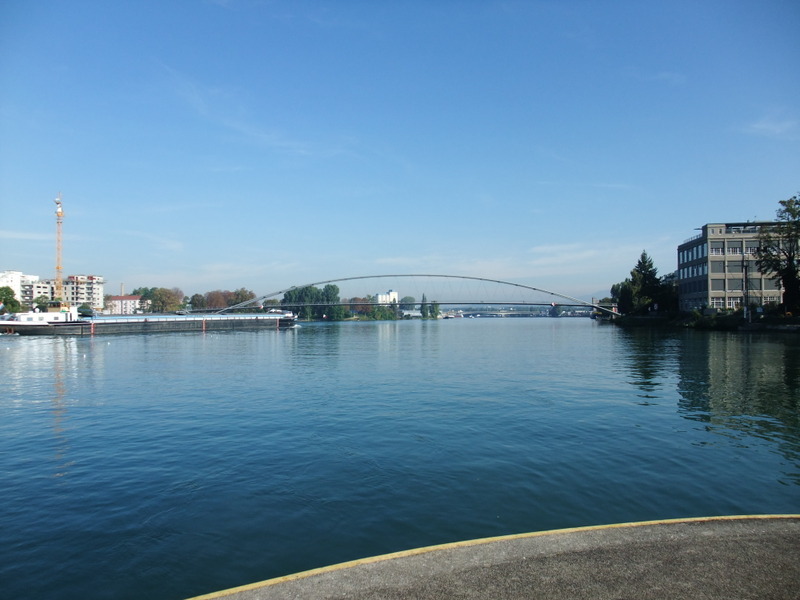 The place that I most wanted to visit in Basel was the three countries' corner, where the borders of three countries crossed. As I wrote before, the borders between countries are intersting for me and maybe for most Japanese people. 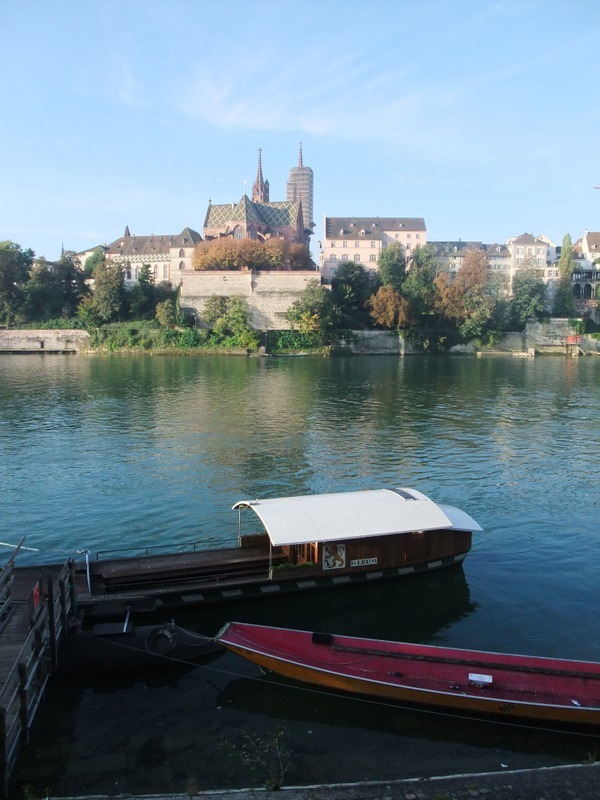 We headed for the river Rhine from Basel Bad Bf at first and turned right downstream. The point where we had turned right was thinned out when I drew the route map and our trace isn't drawn accurately, but the pictures on the map was accurately put on the point where they were taken. That is to say, the marks are on our real track. I'm going to show you some of the pictures that I took on the way to the three countries' corner below. There was a McDonalds just in front of the station. I wondered if there was no place without a McDonalds in the world. They had tables outside and so did it indicate that they had little rain here? 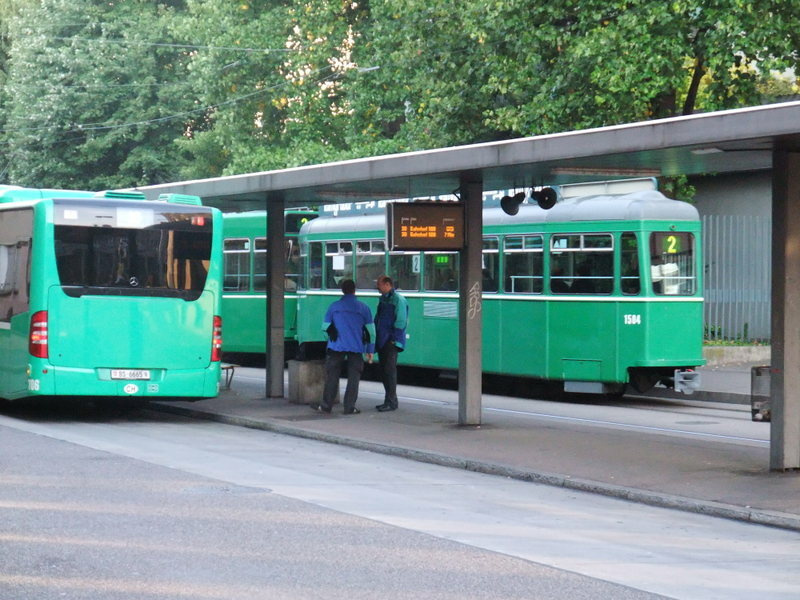 This is the tram station in front of Basel Bad Bf, but unexpectedly it wasn't busy. 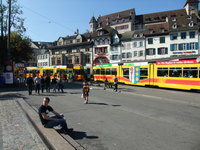 Basel was divided into three areas. This German area might not be the center of the city. 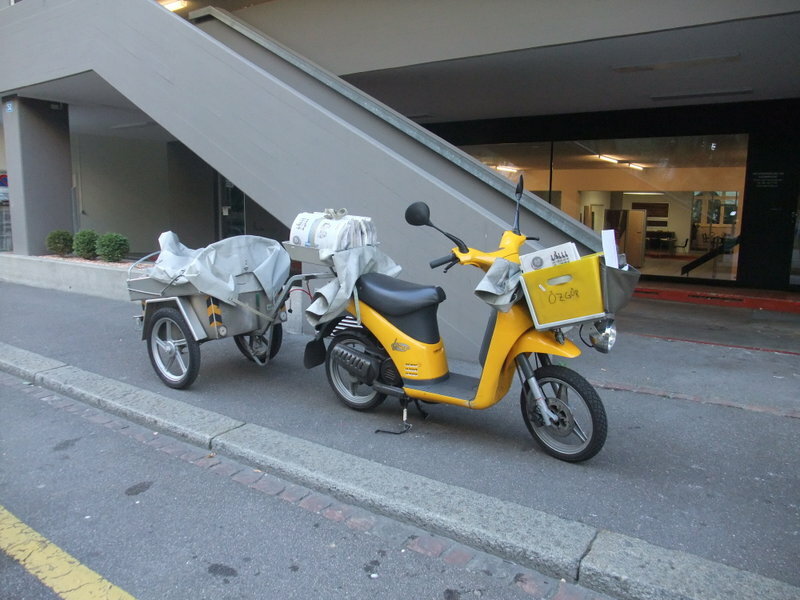 This motorcycle looked like it was delivering newspapers. I frequently saw such a small cage towed by bicycles or motorcycles. In some cases, a little kid was in the cage. I thought it was very functional, and wondered why it wasn't popular in Japan. 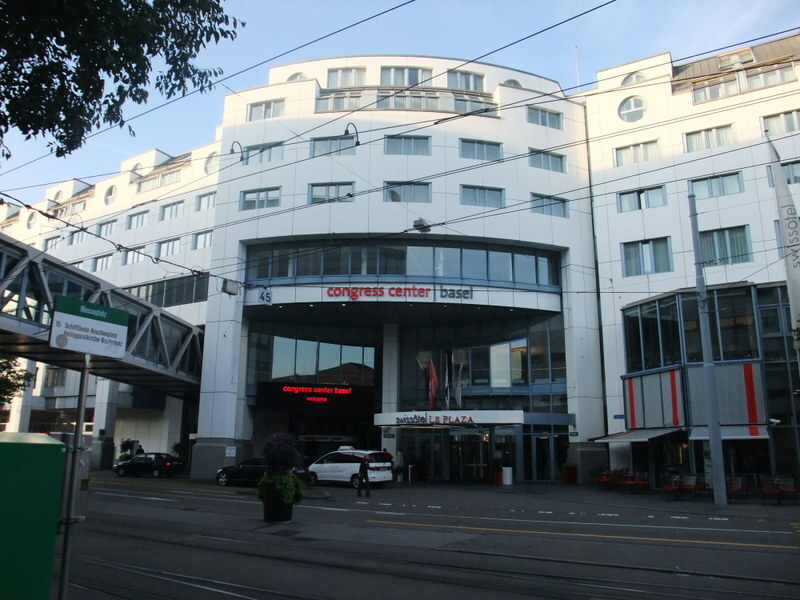 This is the Congress Center of Basel, which is very famous as the place that many international meetings are held. I was enticed to drop in, but we didn't have enough time and passed by it. We reached the riverside of the Rhine. We were lucky to have a nice day. The autumnal breeze over the river was really comfortable. I was moved to actually stand by the river Rhine, which I knew from my class of history or geography. We put off crossing the border, I mean the river Rhine, and turned right and headed downstream. This tiny boat looked like a means of transport between both shores. Needless to say, the opposite shore is Switzerland. There were bridges across the river, so it must have been just for sightseeing. It was a slope for water-skiing. The Rhine around here must have been a nice spot for water-skiing in summer. I found a flashy motorcycle on the way. It was a product of a Japanese automobile manufacturer, HONDA. At first, I made our track onto a map using the data of my data logger and made it linked from "Today's Route" above. The map was roughly what I had expected, but I couldn't use all the functions of the software and couldn't properly thin the data out. Only a single datum made the map inaccurate. 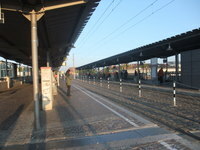 The point of the south of Basel Station is a mistakenly recorded one. You can easily find the point on the map. Anyway, I'm going to continue my trip notes. We had breakfast at the restaurant in the hotel, which was just the same as yesterday. I like meat, but I took vegetables mainly. I was sick of meat. 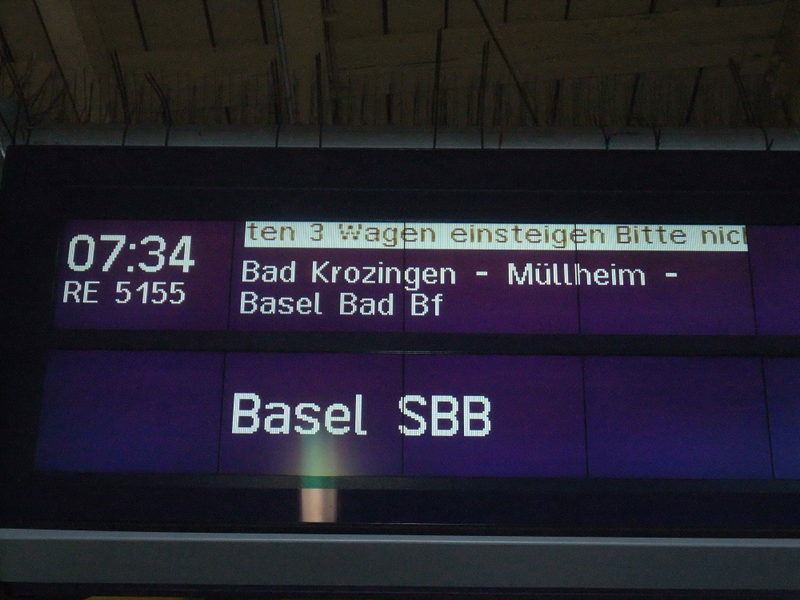 We were going to visit Basel and got on the train which is shown in the picture. 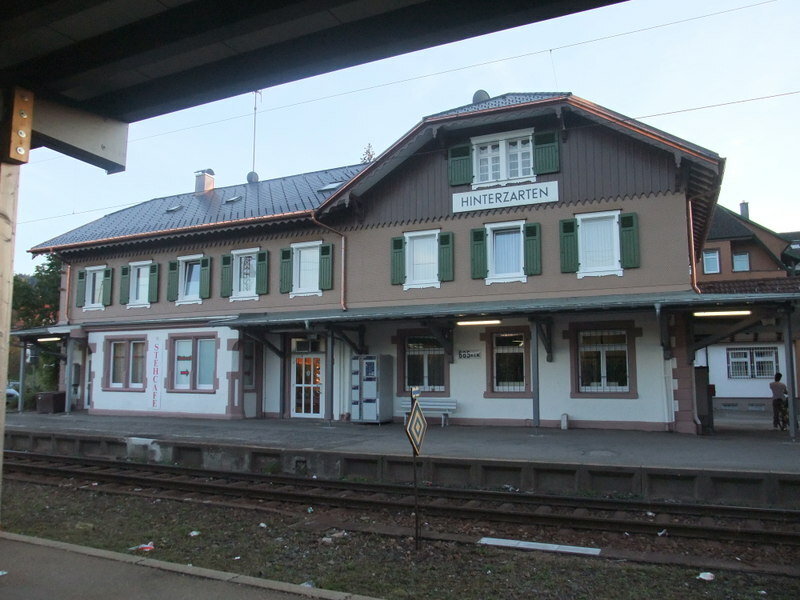 The train was a RE (Regional Express) and would stop at Bad Krozingen, Müllheim, Basel Bad Bf and Basel SBB. 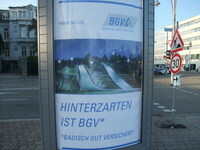 "Bad" means the name of the south-western area of Germany. "SBB" is the abbreviation for Schweizerishe Bundesbahnen in German and it means Swiss National Railways. 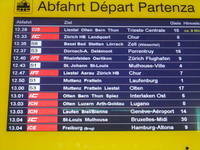 That is to say, Basel has at least two stations in the Bad area and the Swiss area. I'll show you the details of Basel later. 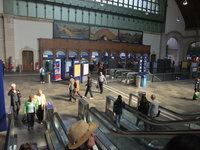 The second picture was of Basel Bad Bf, the Basel station in Baden. "DB" stands for Deutschen Bahn, German National Railways. We started to explore the city from this station. 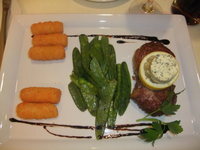 We had dinner at an Italian restaurant on Eisenbahn street. The pastas we ate here were really good and the waiter was also nice. It's rare in Japan to have dinner in the dark outside, but I felt that it was not so bad. The autumnal breeze was comfortable. After dinner we got back to the station and dropped in at a bakery. 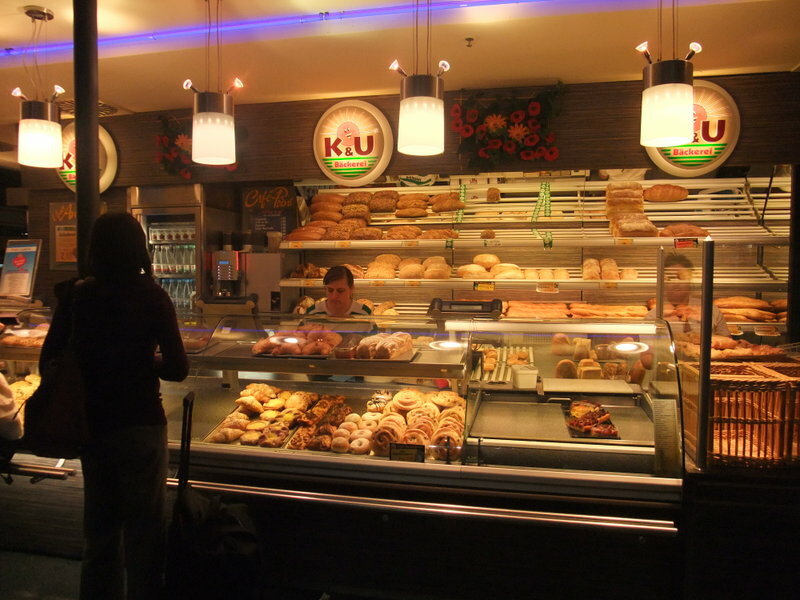 It was an ordinary bakery, I thought, but it was also fun for us to see a strange bakery. 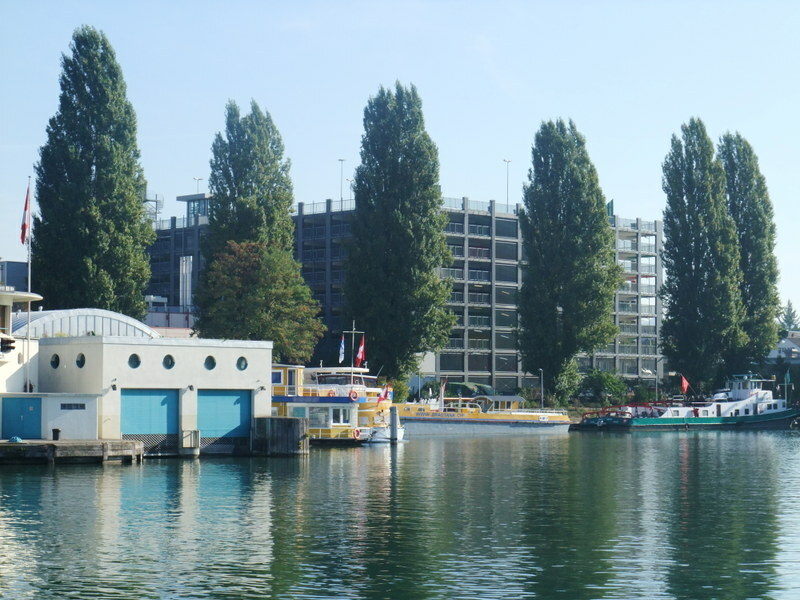 Shortly after the departure, our bus passed over the bridge across the river Rhine and entered the city of Konstanz. I knew the city in my history class in my high school days. I wanted to visit the Konzilgebäude, but didn't have enough time. Our bus turned left just in front of Schnetztor (first picture) and crossed the river Rhine again (second picture). We were running just on the border between Germany and Switzerland at that time, and I knew it when I checked my GPS receiver later in Japan. You can see it on the map linked from "Today's Route" above. Our route to Hinterzarten was through the Black Forest and we were happy campers to see the scenery. Some of my pictures are attached on the map and you can see them. 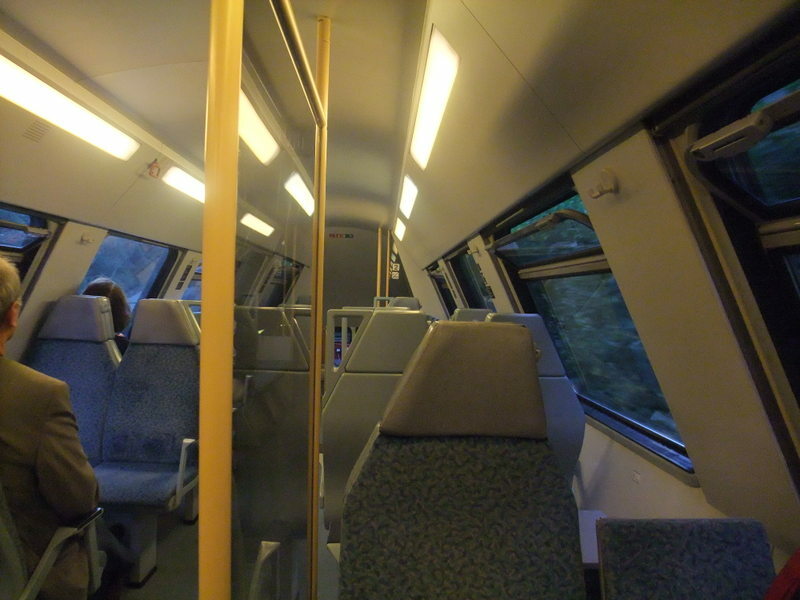 The last two pictures were of inside the train from Hinterzarten to Freiburg.